Castle Crawler & Scaler Series – Get the Lowdown on Rock Race/Crawler Mode! With the recent introduction of the 1406 series brushless sensored motors in a “SLATE” color, Castle is taking low RPMs very seriously. Months of hard work went into this release. We focused on several aspects to cater to the wishes of everyone who loves to run scale. Delivering monstrous torque and ultimate control, combined with the high end speeds that we are known for. We have diverted from our traditional green color with slate colored cans making the motors less noticeable in your scale trucks. Simultaneously we wanted to mark a new product line for Castle Creations which emphasizes that we concentrate on low RPM control. Combined with any of our X series speed controllers these motors will enable you to fine tune and set the controllability of your ride to the maximum, or even use the aux wire to toggle between drag brake settings for example. A brand new running mode is now available available on firmware version V2.02 (Click for complete summary of new features, improvements and changes) and newer for the Mamba Micro X, Mamba X, Mamba Monster X and Mamba XL X ESCs. This is a mode which is designed to allow users to get the most out of their ESC when used in Rock Race or Crawler vehicles. While it can be rather confusing initially, when it is set up correctly it can be very beneficial. This feature is accessed through the use of the programmable Auxiliary Wire that is available on the Mamba Micro X, Mamba X, Mamba Monster X and Mamba XL X ESCs. The AUX wire function is disabled by default but is programmable via Castle Link. Once you have programmed the functionality of the AUX wire, that particular setting can then be adjusted on-the-go from a compatible transmitter. The ‘Rock Race Mode’ and ‘Crawler Mode’ allows the user to switch between two different modes on the fly: ‘Race Mode’ is optimized for either Racing/Bashing and ‘Crawler Mode’ is optimized for crawling. This auxiliary wire mode is designed to allow users to get the most out of their ESC when used in rock racing or rock crawling vehicles. This mode allows the user to switch between two different ‘Reverse Type’ modes on the fly: ‘Rock Race Mode’ and ‘Crawler Mode’. ‘Rock Race Mode’ is optimized for either racing/bashing and ‘Crawler Mode’ is optimized for rock crawling. It also allows you to adjust the motor’s Drag Brake based on the AUX wire signal. Adjusting Drag Brake – While in this mode the motor’s Drag Brake percentage is controlled by AUX wire signal. 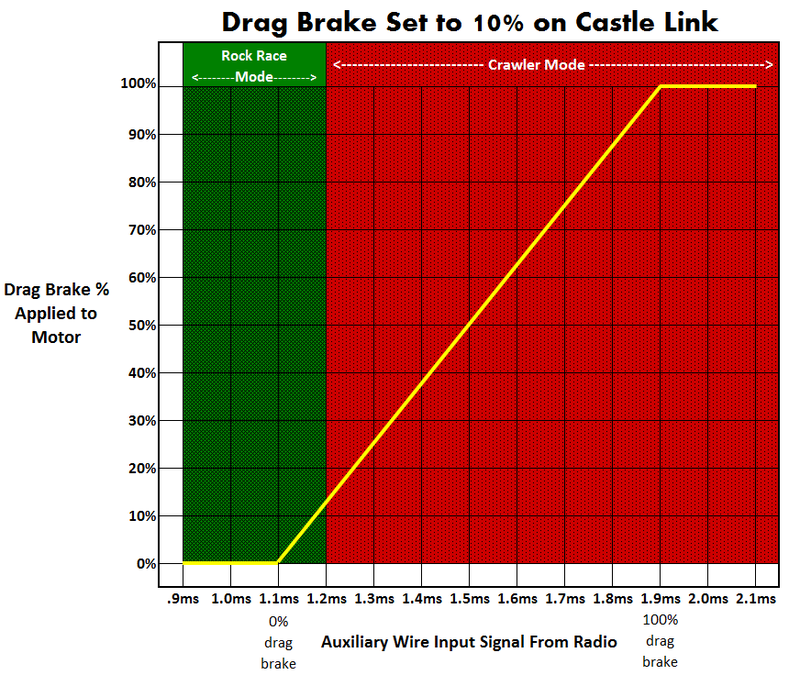 At 1.1ms the Drag Brake will be disabled at 0% and at 1.9ms the Drag Brake will be set to 100%; it is proportional throughout the AUX wire signal range; IE at 1.5ms the Drag Brake will be at 50%. Rock Race Mode – The ‘Reverse Type’ in this mode will be set to the Castle Link ‘Reverse Type’ setting on the Basic tab (default is set to “With Reverse”). Refer to “Reverse Type Definitions” at the end of the document for a full description of each ‘Reverse Type’. Crawler Mode – The “Reverse Type” in this mode will be set to the Castle Link ‘Reverse Type’ setting on the Basic tab (default is set to “With Reverse”). Refer to “Reverse Type Definitions” at the end of the document for a full description of each ‘Reverse Type’. Please see the examples below for a better understanding of how this works. Note: If the AUX wire becomes disconnected, the controller will default to ‘Rock Race Mode’. ‘Rock Race Mode’ is enabled whenever the AUX Wire Drag Brake is at or below 0% (? 1.1ms) and the ‘Reverse Type’ will be set to “Without Reverse”. ‘Crawler Mode’ is enabled whenever the AUX Wire Drag Brake is above 0% (> 1.1ms) and the ‘Reverse Type’ will be set to “Crawler Reverse”. Click here for a diagram of Example 1. ‘Rock Race Mode’ is enabled whenever the AUX Wire Drag Brake is at or below 10% (? ~1.2ms) and the ‘Reverse Type’ will be set to “With Reverse”. 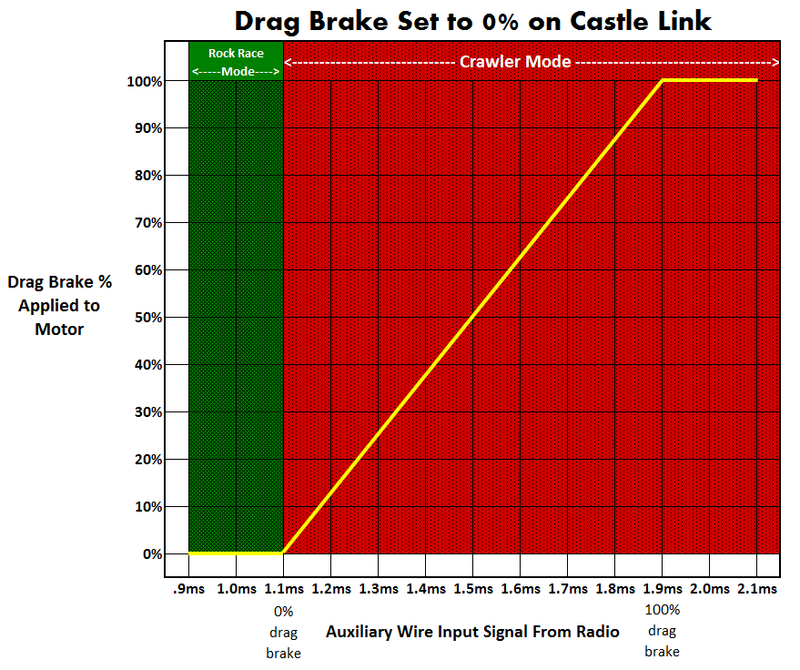 ‘Crawler Mode’ is enabled whenever the AUX Wire Drag Brake is above 10% (> ~1.2ms) and the ‘Reverse Type’ will be set to “Crawler Reverse”. Click here for a diagram of Example 2. ‘Rock Race Mode’ is enabled whenever the AUX Wire Drag Brake is at or below 50% (? ~1.5ms) and the ‘Reverse Type’ will be set to “With Reverse”. 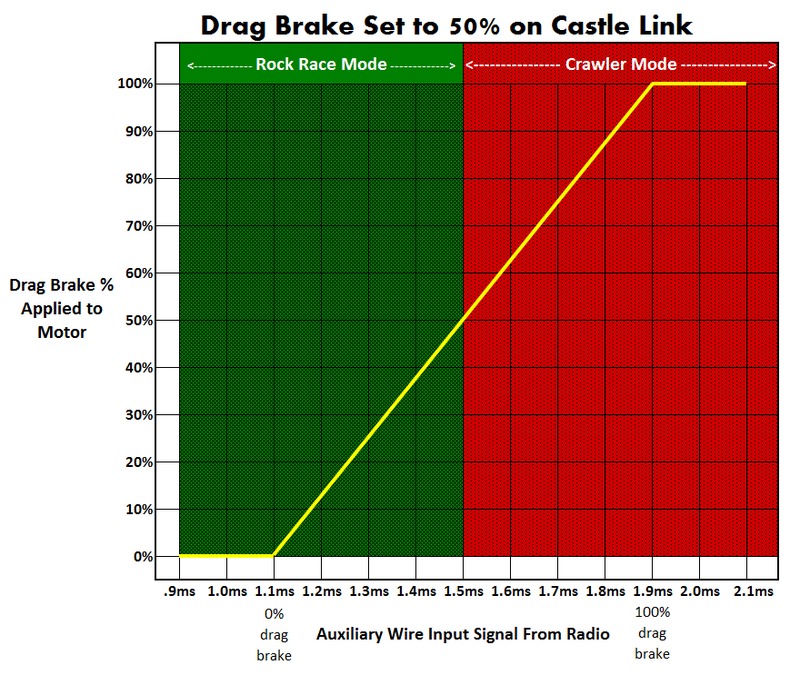 ‘Crawler Mode’ is enabled whenever the AUX Wire Drag Brake is above 50% (> ~1.5ms) and the ‘Reverse Type’ will be set to “Crawler Reverse”. Click here for a diagram of Example 3. “Without Reverse” – Racing Setting. No reverse motor direction. Pressing the reverse trigger on the radio will engage the motor brake. “With Reverse” – For bashing or racing (may not be allowed in some racing situations). When transitioning from throttle to reverse the ESC will brake the motor. To run in reverse the ESC must see a neutral signal for at least 2 seconds before the reverse will engage when reverse trigger is applied. “Crawler Reverse” – The ESC will immediately spin the motor in reverse when the reverse trigger is pressed. The ESC will apply a brake to bring the motor RPM to zero before reversing the motor; this helps prevent potential damage to the vehicle’s drive train. This setting is recommended for low speed rock crawling; using this mode at high speed will result in an amazing front-flip, but expensive repairs. Now that you have the lowdown on the newest features and optimizations, we hope you dig out that Castle Link and hit the trails! CC BEC 2.0 – The Next Generation of Voltage Regulators (BEC) from Castle Creations! Assembled in the USA with foreign and domestic components. Adjustable Output Voltage may be set with Castle Link (sold separately). Weight with full length wires, power wires may be shortened to save weight depending on application. Olathe KS, November 1, 2016 – Castle Creations Inc., the leader in electronic speed controllers (ESC) and BLDC motors for radio controlled (R/C) car, air, and multi-rotor hobby markets, as well as commercial UAV and drone markets, has been providing award winning brushless sensorless motors to R/C enthusiasts worldwide for more than a decade. In response to overwhelming requests, they have brought technological advancements together to deliver unprecedented performance in a new BRUSHLESS SENSORED motor line. Efficiency and reliability were the key elements driving the development of a sensored motor design that could be pushed harder, run longer, stay cooler, and withstand harsh elements. To achieve all of these performance demands and more, Castle engineers integrated rotor position sensor technology with an improved high power and high efficiency motor design. Users will experience PRECISE THROTTLE CONTROL and BUTTERY SMOOTH starts plus the RAW POWER and LONGER RUN TIMES that Castle’s highly efficient brushless sensorless motors are known to produce. The higher the efficiency of a motor the more power it can produce without overheating; the less power it takes to produce the same output power; and the less energy it turns into heat. Efficiency equals performance, these motors are ready to be pushed harder, run longer and stay cooler. Without a robust and reliable design, efficiency will only go so far. Oversized NMB bearings and a vibration dampening system were used to guarantee the longest bearing life possible. High-strength, high-temperature grade neodymium sintered magnets combined with a high-strength Kevlar wrap ensures the integrity of the rotor is not compromised during harsh running conditions. A proprietary winding technique is also used to produce a stator assembly that is the lowest possible resistance, resulting in a cooler running, and longer lasting, motor. IMPROVED 4-POLE 12-SLOT design boasts exceptional EFFICIENCY and produces LESS HEAT. Fully optimized design eliminates the need for mechanical timing adjustments. Castle’s sensor alignment method delivers uniform timing and torque in both directions, automatically. When paired with a Castle Creations SMARTSENSE ™ sensor supported ESC, like the MAMBA MICRO X, MAMBA MAX PRO or MAMBA MONSTER X, you can unlock advanced tuning capabilities that Castle Link provides specifically for sensored motors. SMARTSENSE™ uses the motors sensors to start the motor to provide smooth starts, excellent torque, and low-speed drivability. Once the motor is turning, it seamlessly transitions to Castle’s ULTRA- EFFICIENT sensorless mode. Electronic timing in SMARTSENSE™ will advance timing automatically for peak performance during all driving conditions. This allows users to combine the best of both worlds in an unrivaled HYBRID between smooth sensored startups and high-efficiency sensorless drive. Castle Creations’ initial release of eleven sensored motors, suited for 1:10 and 1:8 scale R/C Surface enthusiasts, will begin shipping in November from Olathe, Kansas. Castle Link software requires a Castle Link USB Adapter and a computer that is running Windows. Castle Link is compatible with Windows Vista, Windows 7, Windows 8 and Windows 10. We are very excited to announce the release of the Sidewinder Micro 2. This release boasts all new updated circuitry and added functionalities. At Castle, our engineers are committed to taking full advantage of advancements in component quality and continuous improvements in software design. As a result, we are thrilled to introduce the Sidewinder Micro 2 to the 1:18th scale community at the same incredible price as its predecessor. The Sidewinder Micro 2 is an ideal brushless power hop-up for 1:18th scale 2WD vehicles and smaller 4WD (up to 2 lbs.) such as the Team Associated RC18B2™ or Dromida SC4 SCT™. Updated electronics and refined software will thrill users with ultra-smooth starts and high power performance. The new adjustable BEC voltage (5.5V or 7.5V) with a 2AMP peak will power your steering servo and receiver with ease. The Sidewinder Micro 2 is ready-to run out of the box. Programming is accessible via the transmitter, a Windows® based PC and a Castle Link USB adapter (purchased separately), or a Field Link card (purchased separately). Castle customers will experience incredible performance enhancements using the full programming suite available through Castle Link ™. Tuning the ESC allows for maximized performance for specific applications and track conditions with adjustable features such as brake amount, start power, punch control and torque limit. The result is an incredible driving experience that will surely outperform and overpower the competition. The Sidewinder Micro 2 can be purchased with a perfectly paired 4 pole brushless 20mm motor in either 4100Kv, 5300Kv or 8200Kv combinations. Each motor boasts the same 4 pole technology we use to toss around 15 pound monster trucks like rag dolls and wheelie 30 pound Baja’s on demand. With the increased efficiency and torque gained from a 4 pole design they will take just about anything the user can throw at them. The 0808 series motors are intended for on-road and off-road applications running up to 3S LiPo and weighing in at up to 2.5lbs. For 2WD and lighter 4WD vehicles (<1.5lbs) we recommend the Sidewinder Micro 2 ESC, and for those with a bit beefier 4WD vehicle (>1.5lbs) we suggest the Mamba Micro X ESC. Updated audible tones have been introduced with the Sidewinder Micro 2 as well. The ability to diagnose and resolve problems in the field are made easy as this ESC will communicate with audible tones when certain conditions are present. Alerts are present for start fail, voltage cutoff, radio glitch, over-temperature, over-current and excessive load detections. Users will have the opportunity to correct potential failures and diagnose pesky setup issues such as radio glitches, or when high current spikes are detected, resulting in excessive load. Eliminating the guesswork and simplifying corrective actions means more time doing what we love, rippin’ through terrain and tearing up asphalt! Additional software enhancements include the addition of Link Live™ to the Sidewinder Micro 2 capabilities. This feature, when enabled, will allow users to experience real-time telemetry data such as battery voltage, ESC temperature and battery ripple. Current options that allow real time telemetry feedback are accessible through Castle’s Serial Link device, which is capable of communicating through several serial protocols. Additionally, compatibility with certain Futaba® S.BUS2 and Spektrum ®X-BUS radio transmitters will be coming soon and the Sidewinder Micro 2 ESC is Telemetry READY! 1:18th scale fans will reap the benefits of the modernized Sidewinder Micro 2. Its versatility and small footprint, combined with an economical price point, will make this brushless combo a favorite for any 1:18th scale enthusiast. RC18B2™ is a trademark of Associated and SC4 SCT™ is a trademark of Hobbico. Programming: Yes, via transmitter, Windows® based PC and a Castle Link USB adapter (purchased separately), or a Field Link Card (purchased separately). Items Needed for Operation: The Sidewinder Micro V2 has 3.5mm bullet connectors on the motor wires and the battery input wires are bare. You must add the connector of your choice to the battery leads. We recommend a high current connector rated for at least 40 amps. Looking to update your Traaxas Slash, Stampede 4x4 or Rally car with one of our legendary Castle Sidewinder ESCs? Our friends at RPM R/C Products have just released a couple of ESC "cages" that make it easier than ever to "Power Up" with Castle. The RPM ESC Cage for both the Castle Sidewinder 3 and the Sidewinder SCT ESCs fit in the stock location on the Traxxas Slash 2WD, Slash 2WD LCG, Slash 4×4, Slash 4×4 LCG, Stampede 4×4 & Rally, while also working on other Traxxas 1/10th scale vehicles. The RPM Cage simplifies ESC installation and maintenance by providing two screw locations that hold the entire assembly in the vehicle, eliminating the use of double-sided tape or hook/loop fasteners to secure your Castle Sidewinder or SCT Sidewinder. To fan or not to fan, those are your choices RPM lets you decide if you want to run a fan or not. Because the cage only encases the ESC body, there is plenty of room to install a Castle ESC cooling fan. This clever design leaves the sides of the ESC open, allowing air to reach them. The folks at RPM also include a separate, encased on / off switch mount that bolts directly to the cage in one of four locations for even more installation versatility. And because the switch mount attaches directly to the cage, no extra time is needed to remove it. Or if you choose, you can mount the switch anywhere you’d like simply by drilling and tapping two 2mm holes. These cool ESC cages retail for $9.95 and are available directly from PRM R/C Products.